Home » Extracurricular Activities » How to Balance Schoolwork with Extracurricular Activities? 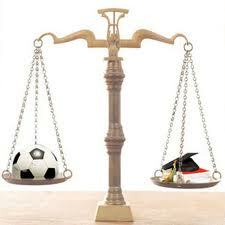 How to Balance Schoolwork with Extracurricular Activities? Most Students have a tough time managing homework along with extracurricular activities. As a result one is given preference over the other. So students tend to focus more on extracurricular activities and school work takes a back seat. Put simply the balancing beam tilts instead of a balance being maintained. Even though participating in extracurricular activities has its benefits but slipping grades isn’t good either. As it is far more important than outside activities. Similarly too many activities can also affect grades in the long run and can have an effect on one’s health as well. Hence, the question How to Balance Schoolwork with extracurricular activities? Comes in to play. Luckily there are few things that you can do to prevent your grades from slipping further. Students can prepare a list of all the things that they need to do for instance a project that is due next month, a test due tomorrow, assignments that are due at different times during the week or a ppt presentation that is due on Monday or a game next week. Once they have listed out all the tasks with their deadlines they then need to sort out the tasks that are important. Once they have all the tasks along with the deadlines, then preparing a calendar comes into play. In the calendar you can make a note of the tasks that are due alongside the date. This will give you a clear view of the tasks that have to be completed and by when. When you have a lot of tests or exams in the coming week it is probably a wise decision to prepare a time table for the purpose of allotting time for each subject. That way you cover more portion within a small amount of time. Knowing how to priorities the tasks is a good skill that everyone should learn. Besides it is said, “Experience is the best teacher”, meaning that what you learn via experience is a lesson learnt well and are sure to remember it too. In chaotic situations you learn the skill of prioritising well; as you are pushed into a corner and need to learn how to manage all the tasks at hand. It is common sense that the tasks that are due later in the current week or tomorrow need to be completed first and as soon as possible. For instance if you have an assignment that is due tomorrow and a dance rehearsal to attend to today, it’s obvious that these tasks should have been completed by now! You need to plan for the worst-case scenario. For example if you have a test due tomorrow but you have to attend a basketball practice it is understood that you have to have finished preparing for the test or if you fall sick the previous day it would have helped if you were half way through your preparation. I’m sure you’ve come across these words quite often so I assume that you know what they mean by now. Nevertheless, to jog your memory, you need to make use of the time that you have wisely if you wish to get all the tasks done in time. For instance if you had to go for a foot ball practice for the match tomorrow and you had an assignment to submit tomorrow itself then if you have managed your time well and completed it way before its deadline then you wouldn’t have to sit down with it immediately when you got home from practice thus you would have got the rest that you would need to perform well in the game tomorrow. Along similar lines of time management is procrastination. It means that if a task is given it is preferable to begin with the task rather than putting it off for another time and then realising that you should have done the task at the time instead of postponing it for another time. For example if you have a project submission tomorrow and a are participating in a Drama today, if you had worked on it at the time it was given to you and managed to finish it by now you would have saved yourself from having to work on it the moment you got back home. Or you would have to finish it in a hurry and it wouldn’t be your best effort. Following these steps will help you to be organised if you haven’t already learnt to be organised. The best and the only way to make both ends meet is by getting organised yourself. If your room is not organised get it organised by reserving some time from your busy schedule for this task. Remember that if your room is not organised finding things when you really need them will be difficult and will hinder your task completion as well. If you find things are all out of control, it’s time for damage control. First and foremost you need to calm down and evaluate all the various possible reasons for the chaos. If it hasn’t helped then it is probably wise to cut down on the number of activities you are participating. Because you are only human with limits. If you find it difficult to identify the various reasons for the chaos, it is preferable to seek help from parents, siblings or friends. Or if the tasks are way too overwhelming for you, it is probably a good idea to slow down, pause and take help from the ones near and dear to you. You need to ensure that you health is in place and in order to achieve this you need to make sure that you eat a healthy diet, sleep on time and get some exercise. Following an unhealthy life style is sometimes the main reason for chaotic situations. Therefore by applying the points discussed, you will be able to balance both schoolwork along with the extracurricular activities smoothly; provided that it doesn’t result in you working in overdrive. And will in turn help you later on in life. Remember to space out all the activity that have to be done as and when it is applicable.